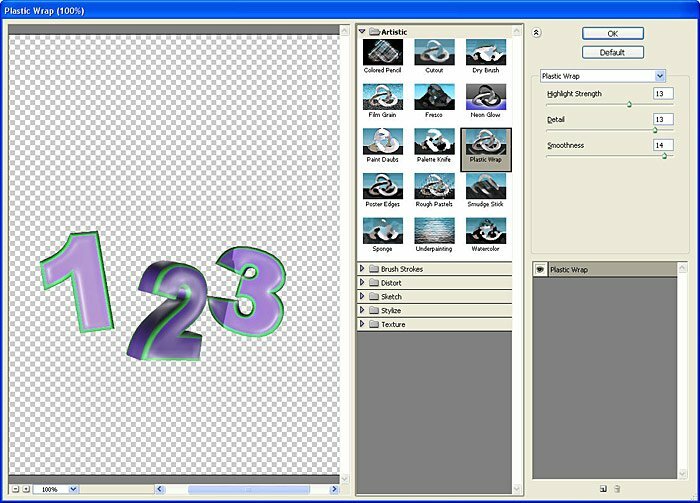 Yesterday, I covered the basics of using Swift3d PS plugin in Phtoshop CS4 Extended. Now, I want get a little more complicated with text. 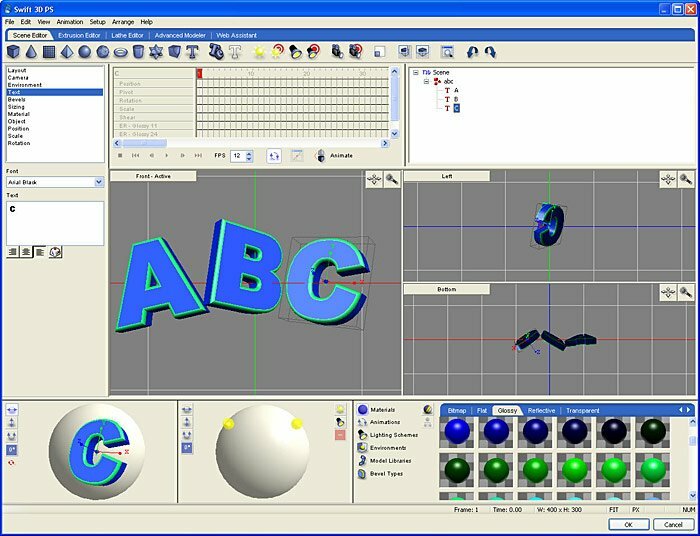 The 3D objects can be manipulated, duplicated and changed very easily. In a new document, I launched Swift3D PS. Starting with some simple text, I clicked on the T icon, changed the font to Arial Black and entered ABC. Then, I added Glossy Blue to all sides and a Glossy Green to the Bevel. These basic steps of selecting a Primitive and apply Materials and Textures are a great way to get the hang of working in 3D. Next to the T icon is the Te icon. 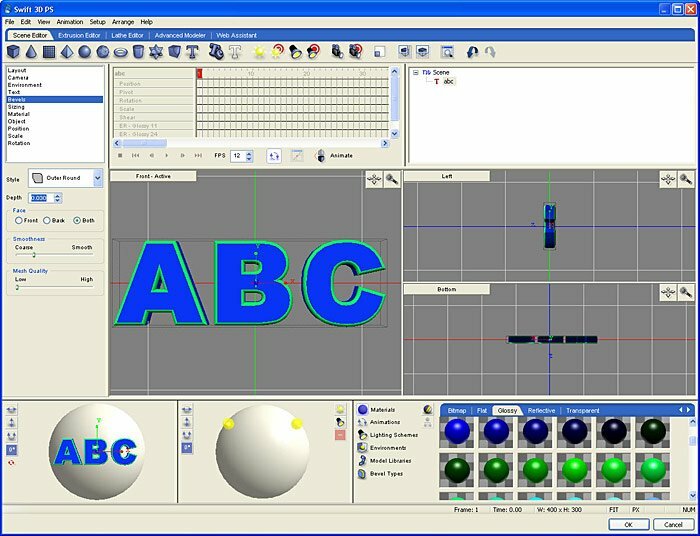 This button changes text into individual text objects which can be independently manipulated. Just click on a letter and it pops into the 3D Rotate tool. You can move the letters further with the cursor keys. Click OK to return to Photoshop. Note that all of the views update to reflect the revised rotation and position. 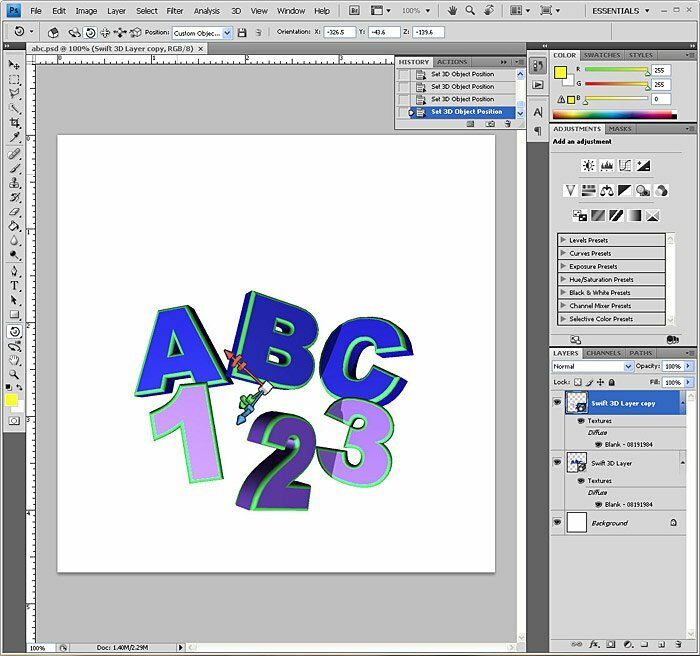 Once back in Photoshop, the 3D Layer can be duplicated just like any other layer. By doing so, you retain the settings of the previous layer, but can launch Swift3D to change the text, color and positions. By converting each Swift3D layer into a Smart Layer, you can now treat them like a regular Photoshop Layer. Just apply Filters and even Blending Modes like Drop Shadows to complete the composition. Swift3D PS really does make 3D object creation easy as 1-2-3! 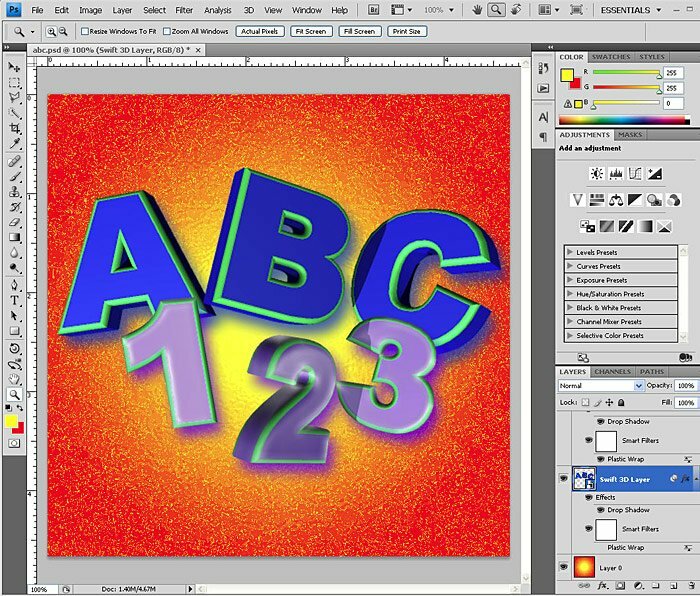 Look for Part 3 of 3D in Photoshop CS4 Extended tomorrow!